Enter the Castle doors if you dare! A modest step down from our Sorcerer’s Castle, this 14′ Castle has a brick look printed on the vinyl and Knights on horses on the front columns. Perfect for those little ones that like to play Prince or Princess. 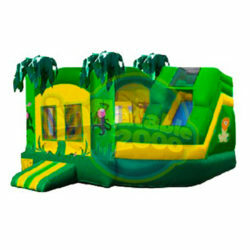 Dimensions: 14′ x 14′ x 7′ Weight: 220 lbs.